Yesterday we hosted our first hygge day at work. In some ways it was perfect: there was snow, we all wanted to be cozy, it was international hygge day, and I had the entire day set with volunteers for morning and evening. 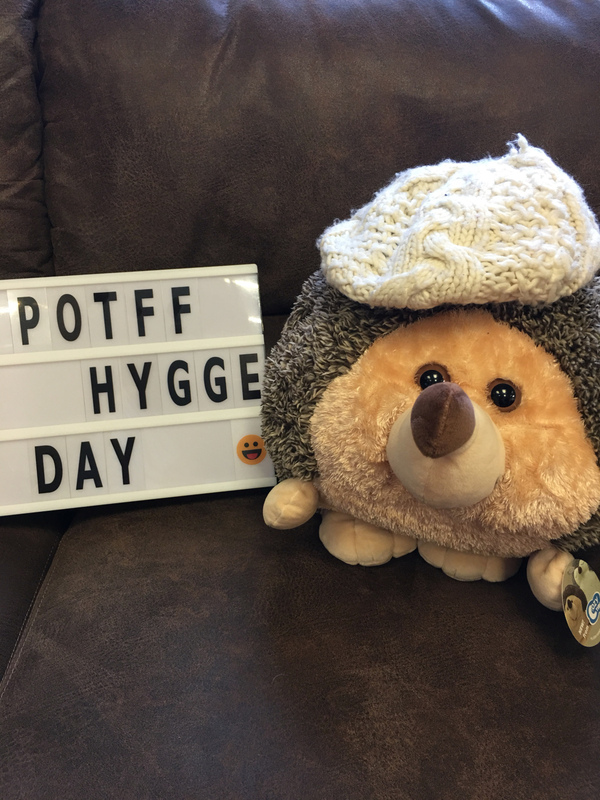 I even made a stuffed animal our mascot: Hygge the Hedgehog. I sent numerous advertisements out, visited people’s workspaces to promote the event, purchased loads of sweets , and even found a hedgehog cake. For those who aren’t familiar with this word , hygge is a Danish term that can be summarised by coziness or as Meik Wiking says “cocoa by candlelight”. Meik Wiking brought this concept to the everyday vernacular the past year with his book “The Little Book of Hygge.” It’s become a sensation throughout the world, and I wanted to share the concept with my workspace. Although their weather in Denmark can be autrocious as it is here in England, they continue to rate as one of the happiest countries in the world each year. Candles, subdued lighting , natural elements indoors (wood), delicious desserts, sentimental items such as scrapbooks and old letters, fireplaces, board games, knitting, warm drinks, connecting with close friends, reading, cuddling, pets, and being in the moment. I have been embracing this concept ever since I read the book two months ago. But the concept of hygge is juxtaposed with my internal achiever that feels guilt for not doing more than one thing at a time. It is serendipitous that yesterday was international hygge day and today is hygge day in Denmark. UK is in an uproar, it is being called “snowmeggedon.” In the past five years I have been in the UK this has never occurred. We have no choice but to hygge. I wonder if I can do this without the need to feel remorse. Generally there is an internal struggle for guilt. It is as if I don’t deserve sick days, or days to simply relax. Now I was being given one get out of jail free pass to use. Yesterday I was encouraging others to be cozy at work, could I do this at home? Can I practice what I preach? And so the hygge began. I played with my dog outside. I was reminded yesterday how much my dog loves snow. He would play his version of soccer, but get distracted by wanting to eat the ice or witnessing the snow fall magically on his face. We don’t see much of snow here in the south of England that sticks to the ground. Snowfalls never occurred during our California and Hawaiian day. Somehow Puzo ,our bulldog , remembers his romps in Connecticut and New York . And he couldn’t get enough of relishing in the snow. Puzo was practicing mindfulness of snow play. He was my real life hygge mascot. Dogs and outdoor activities , combined with warmth to recuperate indoors is also hygge. I am reminded I need to let go and embrace the moment. Instead of feeling like this event I had hosted yesterday was a failure , I can reframe that the universe was offering me and my community the opportunity to hygge. It’s so easy to get stuck in our own heads with internal and external expectations. We get focused on one specific type of results , that we forget the impact we make on others throughout the journey. Perhaps spreading awareness of being present focused and hygge is more of a profound way to impact others, rather than attendance numbers. For today, I will try to practice gentleness and kindness to myself. I will not feel lazy for watching my favourite movie or chilling with the dogs. I will have no other motive than to relax. It’s deserved and available to me right now.